A Montpelier software developer racks up "yes" votes overseas. The U.S. prides itself on exporting democracy, but it’s not so great at getting ballots into the hands of its own citizens overseas. Two years ago, in the 2006 elections, Americans in foreign countries requested one million absentee ballots, but only one third of them — representing 5.5 percent of all eligible overseas voters — were actually counted, according to the federal Election Assistance Administration. Two-thirds of the uncounted ballots never reached the voters who requested them; another 10 percent arrived too late. The digital revolution hasn’t helped, at least where the Department of Defense is concerned. Since 2004, the DOD has spent nearly $1.7 million on an electronic system that is supposed to make it easier for military personnel stationed around the world to vote. In the last two federal elections, a grand total of 25 people used the online system to cast their ballots. In an October 14 letter to the DOD, U.S. Rep. Carolyn Maloney, a Democrat from New York, described the department’s system as a “dismal” failure. “I am disturbed you have chosen to use funding from the taxpayers so unwisely,” she wrote. In the same letter, she praised a rival ballot tool designed by a Montpelier software company. Vermont’s Bear Code has created a TurboTax-style system so that ex-pats and military personnel — about 6 million eligible voters — can have a say in selecting their country’s leaders. Bear Code founder Michael Howe believes his company, which builds custom software for the Web, has succeeded where the DOD didn’t. Users can drill down through pull-down menus and state-specific forms to register to vote in their home state or obtain the correct Federal Write-In Absentee Ballot, or FWAB, a provisional ballot for overseas voters who have not received ballots in the mail. The project, which was funded by the Pew Charitable Trusts, is a collaboration of Bear Code and the Overseas Vote Foundation, a nonprofit founded by Susan Dzieduszycka-Suinat, an American citizen who lives in Munich. Dzieduszycka-Suinat, who has a background in software marketing, says the foundation began using Bear Code’s tool about a year ago to register overseas and military voters. Both the Obama and McCain campaigns have incorporated the registration tool into their websites. So have Rock the Vote, the League of Women Voters and a half-dozen states, including Vermont. Coincidentally, Bear Code got its start outside the U.S.: Its first clients were Russian oil companies. Howe was working for Rebop Records when he founded Bear Code in the late 1990s with a friend with whom he had studied Russian at Bowdoin College. The friend landed a job with the U.S. Department of State in Moscow, where he met a group of programmers who had developed software to “visualize” underground reservoirs. Today, Bear Code employs eight people in Montpelier and another eight at its office in Moscow. The company has developed applications for businesses large and small on five continents. Its Vermont clients include the New England Culinary Institute, BlueCross BlueShield and Seven Days. 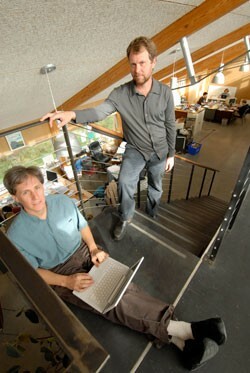 By 2004, Howe and company had “scaled back” from desktop-oriented projects to focus on Web-based applications. Meanwhile, in Munich, Susan Dzieduszycka-Suinat was learning firsthand how difficult it is to vote in elections back home. Dzieduszycka-Suinat worked up 90 pages of specifications, detailing the online system she envisioned, then started looking for someone to build it. Nine software-development companies expressed interest, she said, but Bear Code was the only one that “came remotely close” to understanding what she had in mind. Dzieduszycka-Suinat and the Bear Code crew sealed their partnership over dinner at Hen of the Wood in Waterbury. In June 2007, Daemmon Hughes joined the company and was put in charge of the project. His job was to build an application that reduced the hassles that have frustrated overseas voters for years. Hughes also had to contend with the Uniform and Overseas Citizens Voting Act of 1986. The federal law requires states to allow residents living abroad to cast ballots in federal elections, but permits each state to set its own rules. For instance, all states require voters to have an ID number. Some states want the nine-digit Social Security number, others only the last four digits. Still others require a driver’s license number. A dozen states require ballots to be notarized or “witnessed” before they are mailed. First-time voters from Vermont must sign a declaration attesting that they’ve taken a voter’s oath. Even minor deviations from a state’s rules — which are compiled in a cumbersome 469-page overseas voters’ manual — can disqualify a ballot. Using an Ajax-style application, Hughes came up with what Howe calls 10 steps and a “wizard,” the word for a tool that guides users through a process by asking questions or presenting options. They can access a help desk and a directory of state and local election officials, and download candidate lists for any voting district in the country. Once users get to the correct ballot and voter declaration form, they download the paperwork in PDF format so it can be printed, filled out and snail-mailed — still the only acceptable method of transmission. Another click leads to the “Express Your Vote” program, sponsored by FedEx, which creates shipping labels and arranges for the ballot to be picked up and delivered to the U.S. at a discount. Voters can click here to access the new system. Bear Code is one of the exhibiting businesses at Vermont 3.0: Creative/Tech Career Jam on Saturday, October 25, at Champlain College in Burlington. One of the company’s project managers, Ellery Crane, participates in a panel discussion entitled “So You Wanna Develop Software?” at 2 p.m. in Alumni Auditorium.